- 15 parents/families have gained employment through micro financing. - Around 60 staff workers of the school in which we are working have learned skills in computer training, some of which have gained part time employment. 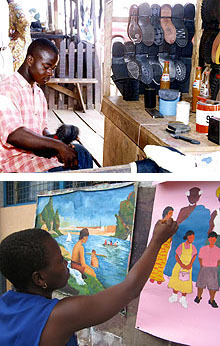 FHI has donated various tools for disabled people to find or create work, in sectors such as carpentry, tailoring, shoemaking. Can you donate materials gifts-in-kind? Please click here to fill a form.